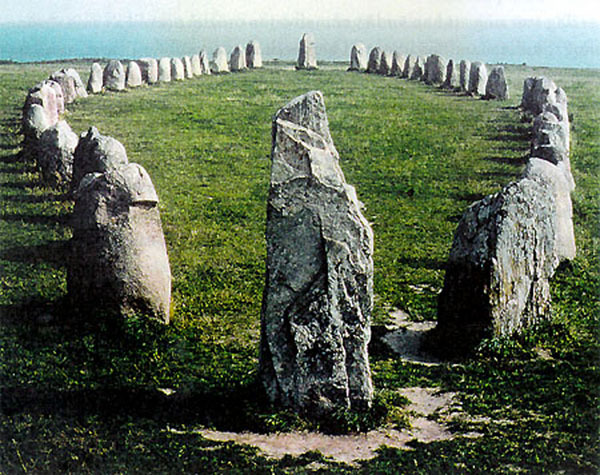 Ale's Stones (or Ales stenar in Swedish) is a megalithic monument in Scania in southern Sweden. It consists of a stone ship 67 meters long formed by 59 large boulders of sandstone, weighing up to 1.8 tonnes each. According to Scanian folklore, a legendary king called King Ale lies buried there. Ale the Strong (Heimskringla) or Ole (English: Ola), in Scandinavian legend, belonged to the House of Skjoldung (Scylding), and he was the son of king Fridleif of Denmark and a cousin of Helgi's (and consequently of the Hrothgar of Beowulf). He fought several battles against king Aun of Uppsala, and he ruled in Uppsala for 25 years until he was killed by Starkad the old. According to Starback and Backstrom, Saxo Grammaticus tells a related story in Gesta Danorum. Starkad was accepted with honour in the warband of the Norwegian hero Ole (Olo). However, when Ole had succeeded in conquering Zealand, Starkad was convinced to join Lennius/Lenus/Lennus scheme to attack and kill Ole. However, Ole was hard to kill as his gaze scared everyone. It was not until Starkad managed to cover Ole's face that he could kill him. Starkad was rewarded with 120 pounds in gold, but regretted his crime, and avenged Ole's death by killing Lennius. The Stone ship or ship setting was an early Germanic burial custom, characteristically Scandinavian but also found in Germany and the Baltic states. The grave or cremation burial is surrounded by tightly or loosely fit slabs or stones in the outline of a ship. They are often found in grave fields, but are sometimes far from any other archaeological remains. Ship settings are of varying sizes, some of monumental proportions. The largest known is the mostly destroyed Jelling stone ship in Denmark, which was at least 170 metres long. 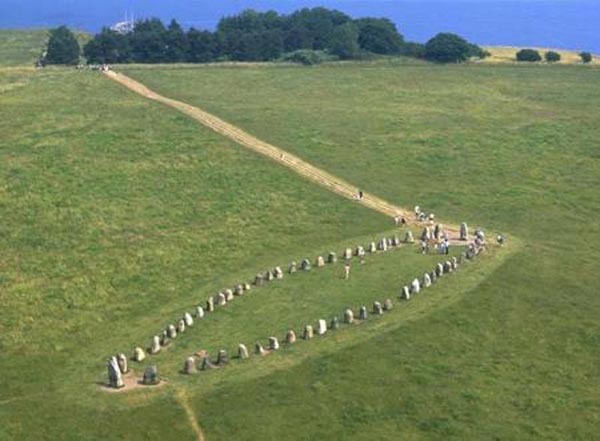 In Sweden, the size varies from 67 metres (Ale's Stones) to only a few metres. The orientation also varies. Inside, they can be cobbled or filled with stones, or have raised stones in the positions of masts. The illusion of being ships has often been reinforced by larger stones at the ends. Some have an oblique stern. Scattered examples are found in Northern Germany and along the coast of the Baltic States. Excavations have shown that they are usually from the latter part of the Nordic Bronze Age, c. 1000 BC - 500 BC (e.g. Gotland) or from the Germanic Iron Age, the Vendel Age and the Viking Age (e.g. Blekinge and Scania). Scholars have suggested both that the stone ship developed out of the desire to equip the dead with everything he had in life, and alternatively that it was specifically associated with the journey to Hel. One puzzling feature is that they sometimes occur at the base of a barrow, enclosing a flat area presumably intended for public ceremonies. In 1989, during the first archaeological excavations performed in order to scientifically investigate and date the monument, archaeologists found a decorated clay pot with burned human bones inside the ship setting. The bones are thought to come from a pyre and to have been placed in the pot at a later date. The pot's contents varied in age; some material was from 330-540 CE while a piece of charred food crust also found inside was determined to be from 540-650 CE. The archaeologists working on the project also found birch charcoal remains from 540-650 CE underneath an undisturbed boulder. According to the Swedish National Heritage Board, carbon-14 dating of the organic material from the site indicates that six of the samples are from around 600 CE, while one sample is from ca. 3500 BCE. The diverging sample came from soot-covered stones that are believed to be the remnants of an older hearth, found close to the ship setting. On the basis of these results, the Swedish National Heritage Board has set a suggested date of creation for Ales Stenar to 1,400 BP, which is the year 600 CE. Ancient Scandinavians dragged 59 boulders to a seaside cliff near what is now the Swedish fishing village of Kaseberga. They carefully arranged the massive stones - each weighing up to 4,000 pounds (1,800 kilograms) - in the outline of a 220-foot-long (67-meter) ship overlooking the Baltic Sea. Archaeologists generally agree this megalithic structure, known as Ales Stenar ("Ale's Stones"), was assembled about 1,000 years ago, near the end of the Iron Age, as a burial monument. But a team of researchers now argues it's really 2,500 years old, dating from the Scandinavian Bronze Age, and was built as an astronomical calendar with the same underlying geometry as England's Stonehenge. "We can now say Stonehenge has a younger sister, but she's so much more beautiful," said Nils-Axel Morner, a retired geologist from Stockholm University who co-authored the paper on the interpretation, published in March in the International Journal of Astronomy and Astrophysics. Other researchers familiar with the site are skeptical. Among other arguments, they cite the results of carbon dating to reject Morner's interpretation. Morner says his team observed that the sun rises and sets at specific points around Ales Stenar at the summer and winter solstices, hinting that an ancient culture could have built it as an astronomical calendar to time things like annual religious ceremonies or planting and harvesting crops. The similarities led Morner to propose the mysterious stone structure of Sweden was a Stonehenge-inspired astronomical calendar constructed by a Bronze Age Scandinavian community that regularly traveled and traded throughout Europe and the Mediterranean. "The first thing is to see that, yes, it's a calendar," Morner told LiveScience. "But Ale's Stones also tells us a lot more than we knew before about trading and travel in the Bronze Age among Scandinavia, England and Greece." Other researchers are not convinced. "The idea that the stone ship might have been an astronomical calendar has no supporters among academic archaeologists," said Swedish archaeologist Martin Rundkvist, managing editor of the archaeology journal Fornvannen. Rather, Ales Stenar was probably an ornate grave marker, he said. The Swedish countryside is home to many similar megalithic structures, which are generally known as stone ships. Most of them date back to Sweden's Late Iron Age (approximately A.D. 500-1000), and they serve as burial monuments, Rundkvist said. Archaeologists using radiocarbon dating have calculated that Ales Stenar was built about 1,400 years ago, near the end of Scandinavia's Iron Age - long after the construction date estimated by Morner's team. Ales Stenar was built by members of a warlike community of seafarers who used oxen, slaves, rope, sleds, wooden spades and simple steel tools to collect and raise the huge boulders, Rundkvist said. "This was the world of Beowulf," Rundkvist said, referring to the epic poem set in Iron Age Scandinavia. Ships were an important part of life in this nautical culture, which may have inspired communities to mark the graves of important people with stone ships, some scholars say. Rundkvist believes there's no evidence for anything beyond that - including Morner's Stonehenge theory. "New Age mystics like standing stones," Rundkvist told LiveScience.